If you've ever considered becoming a dolphin trainer or are just fascinated by these affectionate sea creatures, the Cabo Dolphin Center's Trainer for a Day program will be your dream come true. Designed especially with those who want to learn to care for and train marine mammals in mind, the Trainer for a Day program gives you the opportunity to spend a day learning from some of the best trainers in the business and developing close bonds with our resident pod of charming Pacific Bottlenose Dolphins. You'll be provided with lunch, a trainer's uniform and plenty of swim time with this engaging group of marine mammals. To commemorate this once in a lifetime experience, you'll also receive a diploma, a DVD and digital photos. As a Trainer for a Day, you'll be actively involved in all aspects of training our family of dolphins, both poolside and in the pool, throughout the day. You'll help our trainers conduct the Swim with Dolphins program and learn the basics of training and caring for these fascinating creatures. All day long, you'll be treated as an active member of our team and get a closer look at the exciting careers of marine professionals. Because the Trainer for a Day program provides an intense, hands-on experience groups are limited to four and swimmers must be 12 years or older and in good physical condition. For your safety and the safety of our dolphins, sunscreen can only be used outside of the pool and no jewelry is allowed. A bathing suit and towel are required. To ensure the safety of our dolphins and swimmers, Cabo Dolphin Center does not allow cameras in pool areas. However, a team of specially trained photographers will be available to capture your training experience. Photos, as well as beverages, food and souvenirs, can be purchased at the Dolphin Center gift shop. The Dolphin Center has been featured in many internationally respected newspapers and magazines, such as the New York Times, Los Angeles Times, National Geographic, and Frommer's, among others, so be aware that this popular tour will fill up quickly. 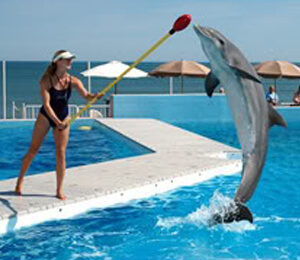 Be sure to reserve a spot as an actual dolphin trainer well in advance of your trip to Los Cabos. The Cabo Dolphin Center Trainer for a Day program will fulfill your dreams of working with dolphins no matter what your experience level. You'll learn what the life of a dolphin trainer is really like, experience dolphin care and training for yourself and, most importantly, spend a day with the affectionate and intelligent marine mammals who never fail to touch their human companions. Q: Do I need to reserve in advance? A: We have a limited number of participants during our dolphin activities, so in order to assure your place we suggest your reservation in advance, especially if you plan to visit us during the high vacation season. Q: May I bring a camera or video camera to take pictures? A: Cameras are not allowed into the pools or observation areas for your safety, for the dolphins safety and the safety of the equipment but professional photos will be available for purchase after your experience. A: While we recommend you wear sunscreen, it must be biodegradable for the protection of our dolphins and sea lions. Any other sunscreen must be showered off before entering the dolphin area. Our gift shops sell biodegradable sunscreen. Q: Can I wear jewelry? A: We recommend you remove all jewelry, including wedding rings, ear rings, and piercings, before coming to the dolphin center. Although we provide an area to secure your personal belongings, it is easy to drop, lose or misplace jewelry, so we recommend you to leave your jewelry and small items secured in your accommodation’s safe or front desk safe. Q: Why do we limit the number of sessions for people to interact with dolphins? A: At Cabo Dolphins, the animals' health and welfare are of primary importance. The sessions are limited to ensure an enjoyable schedule including a variety of activities for the dolphins. The dolphins spend only a combined total of less than two hours each day voluntarily interacting with the public. The rest of the day is allocated to the dolphins' private time, valuable training time, as well as play and social interaction. Q: How safe are Interactive Programs? A: In-water interactive programs have a remarkable, well-established record of dolphin and human safety. The health and safety records of these innovative programs have been studied, analyzed, and restudied for over 20 years, each time reaffirming their exemplary achievements. Q: Can I make a Dolphin sick if I participate in a swim program? A: Since the initiation of in-water marine mammal interactive programs in 1985, there has not been one instance of disease transmission between humans and dolphins reported at any of the facilities that offer "swim with the dolphin" programs. Q: Can I do any of the dolphin programs if I am pregnant? A: For your personal safety and the well being of your unborn child we do not allow pregnant women to participate in our dolphin and sea lion programs. Q: Where is the Dolphin Center located? A: In the heart of Marina Cabo San Lucas, 5 minutes walk from the cruise ship pier, close to the Mexican Flea Market and a 10 minute stroll from downtown Los Cabos. Minimum age is 12 years old. Participants must be in good physical condition. Life vests provided for your safety must be worn. Please do not wear sunscreen or jewelry. For safety reasons, cameras are not allowed in any of the pool areas. Expecting mothers are not permitted on this program. Cruise ship guests must book through their cruise lines for this tour. Swim With Dolphins Cabo is always interested in your tour experience with us. We hope you enjoyed your tour and love to hear comments. I have been to the Bahamas many times, but Cabo Dolphin Trainer For A Day is one of my favorite trips! It includes everything that everyone should do here. As a Bahamas veteran, I can say only the best about this experience!